These are step-ups from my single days when I was mastering the art of cooking spaghetti and frozen pizza. The three-course Sunday meal below is another small step for me, and one giant step for your taste buds (if you don’t know, Katy loves space-related things). This meal is recommended for 3-4 people (or leftovers for 2 people), so it didn’t hurt that her mom joined us for dinner. She gave it rave reviews, as did we. It didn’t hurt that the wine you use for the chicken francese recipe can also be used to drink, too. The first of two things I recommend (besides drinking the wine) is to make the salad before anything else and set in the fridge so the flavors soak together. 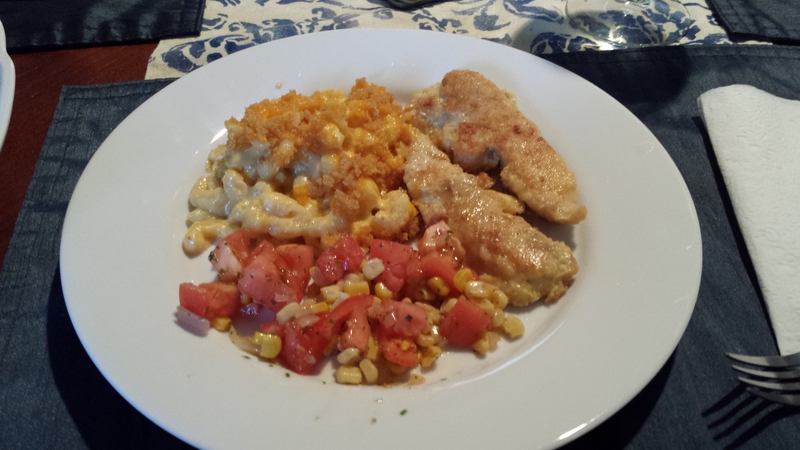 The cold, crispness of the salad compliments the non-healthy creaminess of the mac & cheese. The other recommendation is to prepare/cook the chicken while the mac & cheese is in the oven. This is so both dishes come out hot and ready at the same time. Thank you to my wife for letting me write this – and for letting me cook new things for her! BAKED MACARONI AND CHEESE. We used this recipe, which was rated as one of Food Network’s Top 10 best recipes of 2013. Katy handled the majority of the prep for this, which included making a roux and then a bechamel. But It was worth the effort. We figured we should have some sort of vegetable on the plate to counteract the pan-fried chicken and carb-filled mac and cheese. We had some tomatoes on hand and I thought we could whip up some sort of salad to go with it. So voila. This was what we came up with. We used frozen corn since, but this would be so much better with fresh corn on the grill come summetime. 1) Heat one tsp of olive oil in a skillet over medium high heat. Add the shallot and saute until translucent. Add the corn and cook for about five minutes. 2) Add the warm corn to a bowl with the diced tomatoes. Sprinkle on the Sunny Paris and the salt and pepper and mix together. Let cool in the fridge until ready to serve. I have survived my first two days at the new job! Hooray! And now that I have some time to blog, I can finally share my weekend eating extravaganza with you. Some friends — Lauren and Jason — were visiting us this weekend so we had planned on a good deal of eating out. After I fetched them at the airport on Saturday morning, we headed over to the Westside of Atlanta where we spent most of the day. We started off with lunch at Star Provisions. This was my second time eating there and it has been delicious both times. I had this amazing chicken sandwich — the bread was incredible. Bread is very important to me as you know. After we finished lunched, we walked across the way to Jeni’s Splendid Ice Cream. As I mentioned on Friday, Lauren and I had been jonesing to go to Jeni’s for awhile. And it did not disappoint. Don’t go in expecting your typical mint chocolate chip and cookies and cream. These are gourmet ice creams. I tried a goat cheese ice cream with cherries, and while it might sound weird, it was quite delicious. I ended up getting ndali estate vanilla bean and black coffee. For dinner that night, we hit up Fox Bros. The hour-long Saturday wait didn’t deter us, and our patience was rewarded with amazing bar-b-que. My love of their Frito Pie now knows no bounds. 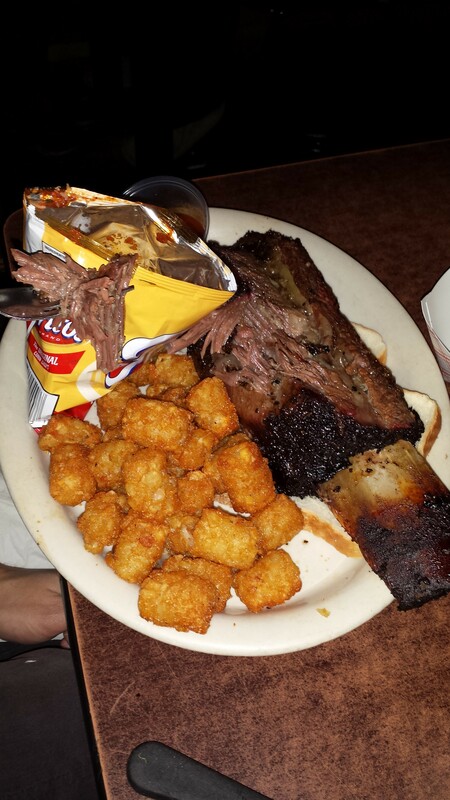 Eric got their beef rib special and it wasn’t just tasty — it was massive. He did manage to eat most of it, which I found to be quite impressive. The main event of the weekend was my birthday dinner at Canoe. It was hands down one of the best dining experiences of my life. The service, the ambiance, the food. All amazing. I can’t wait to go back. I ordered one of their signature dishes — the rabbit. 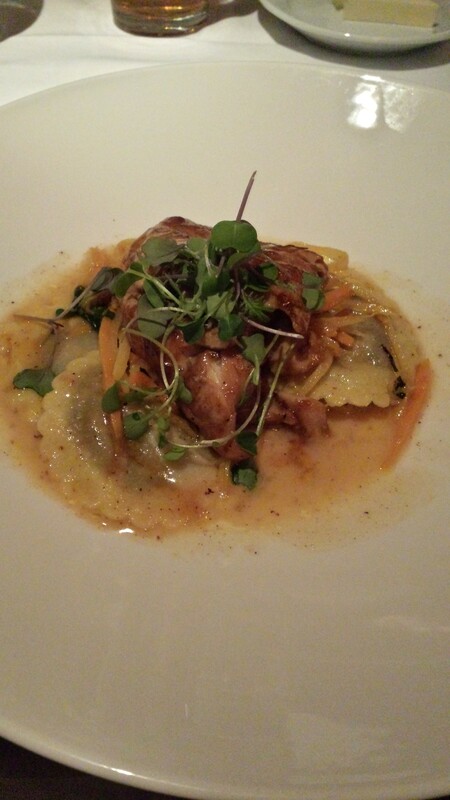 The rabbit is slow cooked and served alongside these chard and bacon ravioli — WHICH ARE INCREDIBLE. I didn’t think my main course could be topped, but that all changed when dessert arrived. 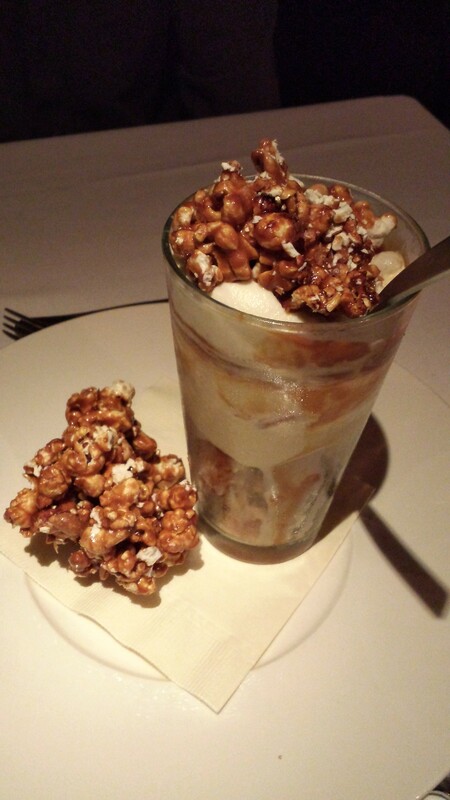 Behold the popcorn ice cream sundae. Canoe’s homemade Cracker Jack with ice cream and caramel sauce. Shut. Up. I mean really. The texture combination of the ice cream and the popcorn is addictive. Eric and I were battling for the final bite (which I of course got since it was my birthday). All in all, it was a great weekend filled with great food — but more importantly great people. It is now time for me to share the news I alluded to last week. No, it’s not a baby…it’s a new job! Today is my last day at my current job and I start my new one on Monday. I’m going to miss my old co-workers, but I’m super excited about this new opportunity. I’m going from working from home to commuting and being back in an office, so it’s going to be a bit of a transition. I’m going to have to be a better planner when it comes to blogging so I don’t leave y’all hanging! The reason I’ve been so absent the past few weeks is because I was in and out of phone interviews and in person interviews and then doing my current work on top of it. Blogging sort of fell by the wayside. But I’m going to make a conscious effort to stay on top of things because I love this blog and want to keep it going. But hang with me through the next few weeks of transition. I’ll figure things out eventually. 1) One of my faves this week — and going forward — is Eric’s new goal to start cooking for me more. With the new job, him taking over cooking duties a few nights a week is going to be awesome. He’s already started to show some skills. The past two weeks he has made a couple of super tasty dinners. 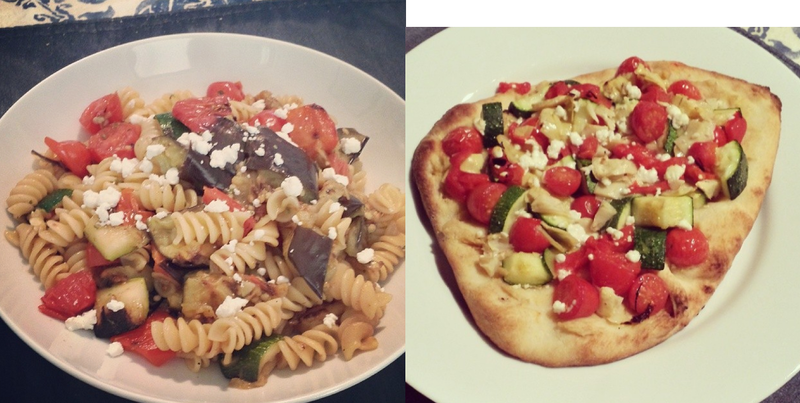 On the left, grilled ratatouille pasta. On the right, Mediterranean flat bread. Both delicious — an nutritious! He knows I have been trying to eat better so he has been cooking a lot of vegetables. And he is very good at it. 2) My birthday is this weekend! I enter the final years of my 20s on Sunday. Eric is taking me to Canoe in Atlanta for my birthday dinner and I’m super excited. It has been on my must-try list since we moved back. We also have some friends coming to stay with us on Saturday. We plan on heading to Fox Bros on Saturday night, and I’m already dreaming about the Frito Pie. 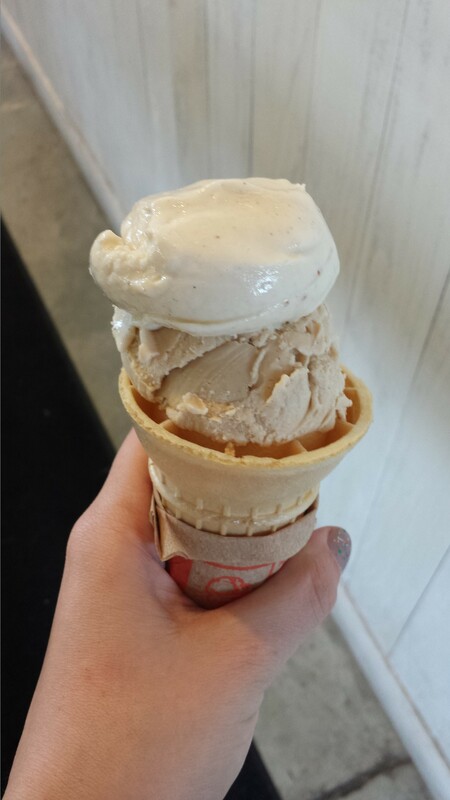 We are also going to hit up Jeni’s Splendid Ice Creams tomorrow afternoon. My friend Lauren and I have been talking about it pretty much every day since they booked their trip. I will be sure to report on all of our weekend eating adventures next week. 3) Anyone have any good recs for places to eat in Charleston? We’re heading there in a few weeks for a friend’s wedding and are looking for a good place for dinner and brunch. We’ve never been. so we are relying on other people to tell us what’s good so let me know in the comments! After a weekend filled with tacos and Cracker Barrel, I knew Sunday night was going to need a lightened up dinner. 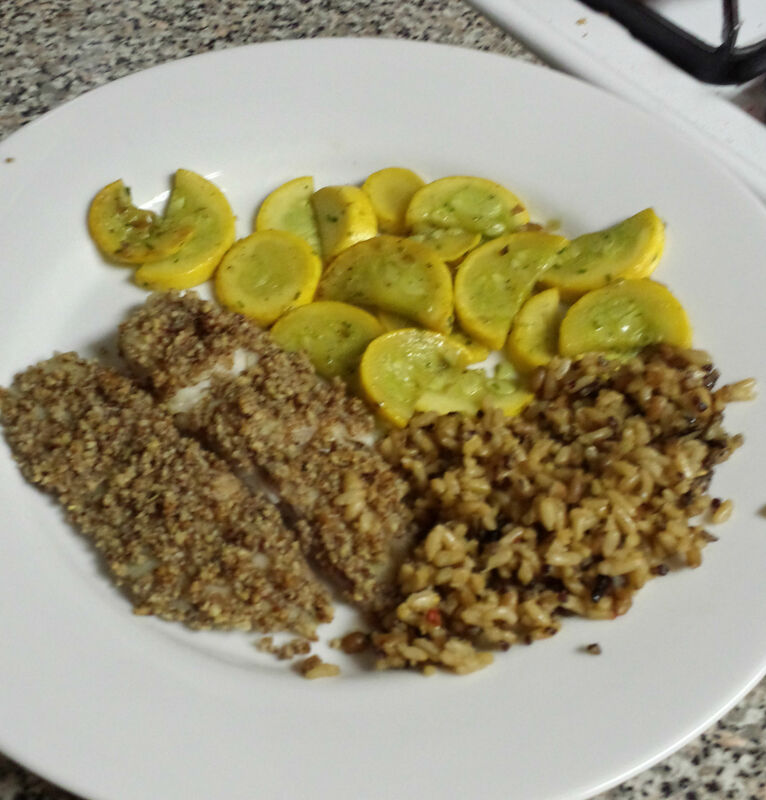 I had some tilapia already and knew I wanted to do some sort of pecan crusted tilapia. I took to the trust interwebs to find a recipe and they all seemed rather involved to me. Flour, breadcrumbs, eggs, frying. I just wanted a simple baked pecan crusted tilapia with a few ingredients. And this is what I came up with. The picture isn’t the best, but this was seriously delicious, I sauteed up some squash with herbs and served it along side some wild rice and it was a tasty, light meal. PS Have you been to Penzey Spices? I used their Sunny Paris blend on the squash and it was so good. I think it is going to be super delicious on grilled veggies this summer. 1) Preheat oven to 375 degrees. If possible, put a cooling rack on a cookie sheet to use for baking. This helps keep the pecan crust from getting soggy. 2) In a food processor or blender, mix together the pecans, rosemary, garlic, salt and pepper. The consistency should be a little coarser than bread crumbs, but not super chunky. The finer it is, the better it will adhere to the fish. 3) Brush each fish filet with the mustard on both sides and coat with the pecan mixture. Place on the cookie sheet and bake for 10 to 12 minutes until the fish is cooked through. First of all, let me say greetings from snowy Atlanta. As some of you might have seen, we got about 2 inches of snow yesterday and it turned in to a total nightmare. Luckily, I work from home and Eric made it home before the roads got super bad, so we weren’t stranded in our cars. But I know plenty of people who were. Fingers crossed things thaw out soon. Now on to the post. I have written before about my love of semi-homemade baked goods, and sometimes, you need to extend that practice to other aspects of cooking. I like to call this fauxmade (did I make that up? Probably not, but it sounds good). To me fauxmade is when you take some precooked ingredients or other shortcuts to make something that tastes like you slaved over a hot stove all day. Only part of the effort but still a delicious result. 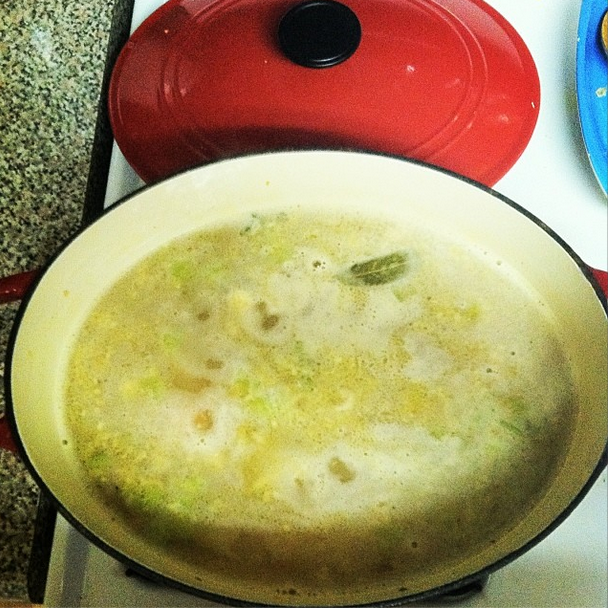 This was a pot of chicken and rice soup I made a few weeks ago. Instead of making my own stock with chicken and bones, I used bouillon and the juices and meat from a rotisserie chicken. That combination made for a rich, delicious soup that both Eric and I slurped down. We preferred it to a chicken and rice soup I tried before that cooked all day in the crock pot. The above soup came together in about an hour. Rotisserie chickens really are a fauxmade chef’s best friend. I have used them before to make soups, salads, tacos or quesadillas — even a stuffing for homemade/fauxmade ravioli. A $5 rotisserie chicken from Costco will feed Eric and I for at least two dinners, maybe even more. 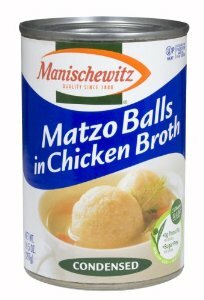 I was inspired to write this post yesterday after I took a can of Manischewitz matzo ball soup and doctored it up to make it taste a bit more like the soup my mother-in-law makes. I put it in a pot with a little bouillon and water, added some carrots and parsley. It was quite tasty. What are some of your favorite fauxmade cooking tricks?